Life expectancy in the wild: 10 years. Adélie penguins are easy to identify, and they cannot be confused with any other species because of its unique appearance. The color of its plumage is black from the top of the throat, covering all the face, the head and it continues from there to the back of its body and down to the tail. Its front is white starting from the throat and going down to the beginning of the legs. Its most striking feature is a white ring around each eye. The easiest way to identify an adult from a young individual, as the latter does not have the white ring around the eyes. Its short, thick beak is black with dark red parts, and its legs are light pink. Its flippers are completely black on the outside but light pink and white on the inside. Chicks have feathers with a color ranging from silver gray to dark gray. Adelie penguins walking and sliding on its belly. Adélie penguins live in Antarctica and the islands surrounding the continent such as Shetland, South Orkney, and the South Sandwich Islands. Their largest colonies locate at Cape Adare, Adélie Land, Cape Royds, Cape Crozier and Hope Bay. 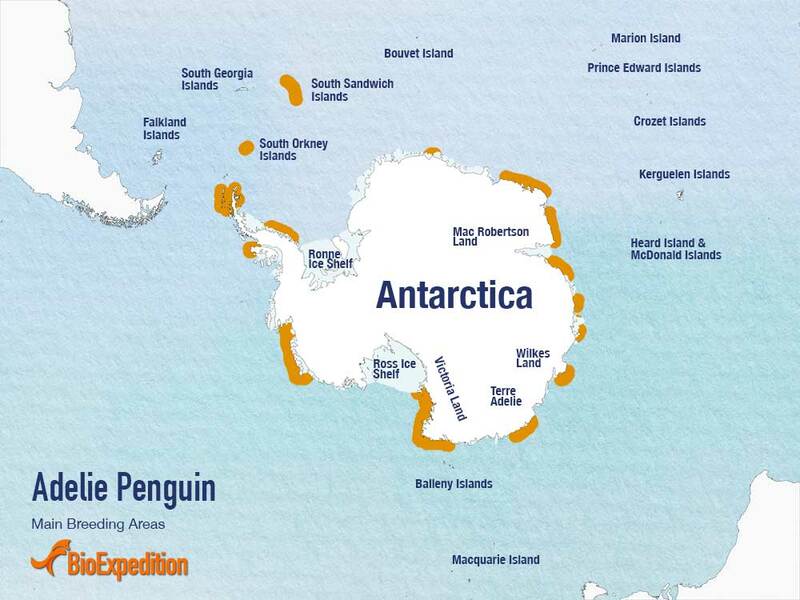 Their habitat is mostly open areas, icebergs, and rocky shores. The land where they inhabit is usually ice and snow or mud. 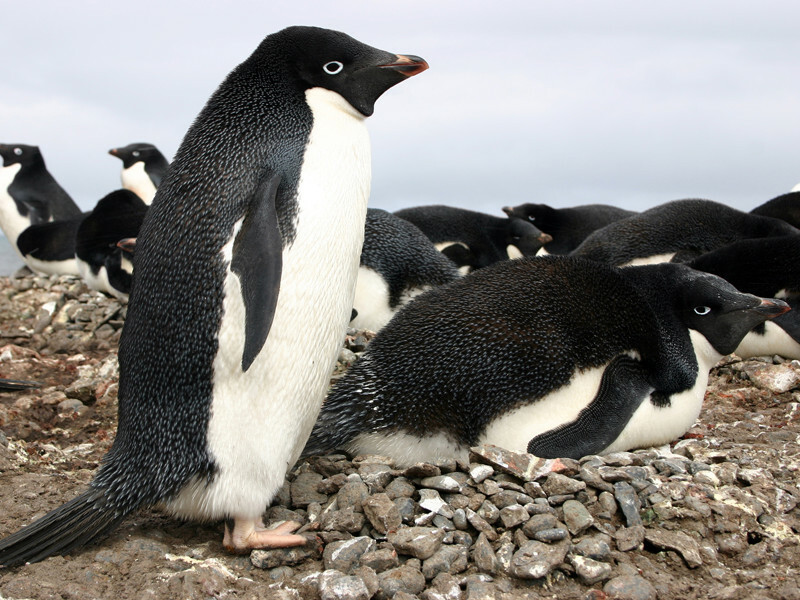 Adélie penguins hunting strategies vary according to their conditions and needs. 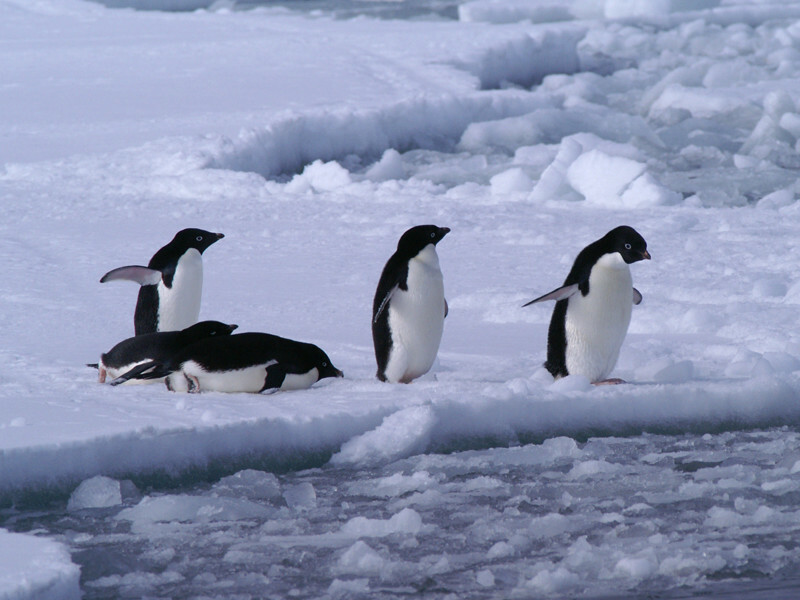 Adélie penguins hunting strategies vary according to their conditions and needs. During breeding season, females can dive more time than males and go farther away from the coast to have more food choices. These penguins are migratory, and they are absent from their colonies during the months of April to September when they make long journeys of thousands of miles. They communicate through a set of vocalizations performed according to the requirements of a particular situation; a growl for territorial disputes or to suggest an intruder following a different path; a slow and repetitive growl when it is about to attack, and a continuous grunt when a confrontation starts. They also make vocalizations similar to a trumpet sound and during courtship they emit softer sounds than those. Chicks get attention from their parents producing uninterrupted loud calls that continue until they get food. During molting, they spend many hours sleeping and become more sensitive and irritable. The entire process of molting takes about 20 days. 1.- They find a place to settle together with another individual. 2.- Their flippers begin to get thicker, and their feathers lose their luster. 3.- The new feathers start to getting ready. 1.- The old feathers start to fall. 2.- Fresh plumage appears and old feathers fall out quickly. 3.- Most of the plumage arises, except in some areas of the head and feet. This process takes about three days. 1.- Penguins have to wait 3 to 4 days to get their feathers strong enough to withstand the cold water. These skilled swimmers depend 98% on krill but may supplement their diet with glacial squid, amphipods and fish such as the Antarctic silverfish. Sexual maturity: From 4 to 6 years. Incubation period: 32 to 36 days. Between September and October, Adélie males arrive at the breeding colonies before females, and the process of courtship begin. Nest building is a long process; with help from their beaks, they collect stone by stone and take it to the place they chose to form a small mound. During this stage they become very aggressive and territorial. During this stage they become very aggressive and territorial; some individuals dare to steal stones from others to take them to their nests, which triggers fights, chases, beak attacks and a lot of energy expenditure. Females lay two eggs, which can vary significantly in size, and if food is scarce, only one of them will receive the attention of the parents while the other will die. The first egg weighs about 4.4 oz while the second is approximately 10% lighter. Both parents take turns incubating the eggs as well as feeding the chicks. Both parents are very devoted taking care and defending their offspring while they grow. Adélie penguins have natural enemies as leopard seals and orcas, which attack adults in the ocean. Eggs and chicks are in danger when petrels, skuas, and other large birds roam the area. Indirectly, we are the major threat for these penguins by increasing global warming. Research stations and aircraft trips disturb nesting colonies that force them to seek more peaceful places. Pollution also represents a threat to them and their food sources. Salomon, David. Penguin-pedia, photographs and facts from one man’s search for the penguins pf the world. Brown Books. 2011. 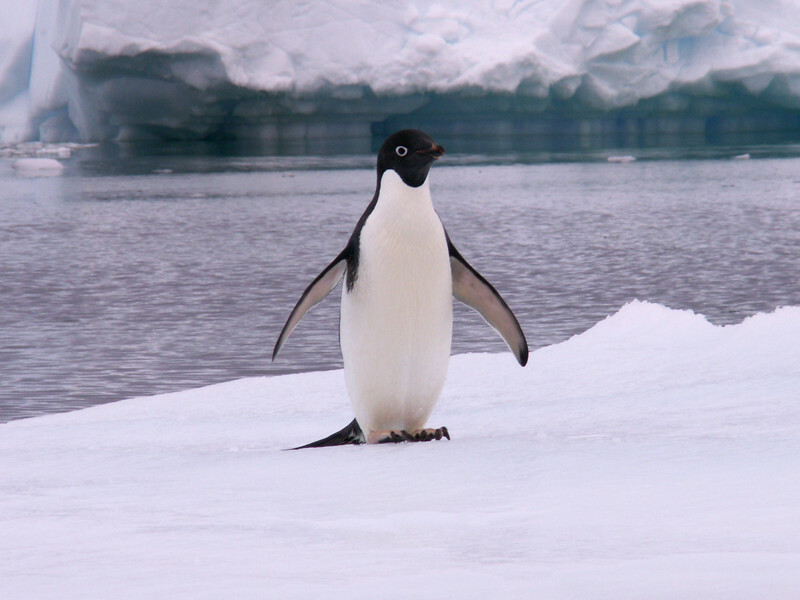 Ainley, David G. The Adélie Penguin: Bellwether of Climate Change. Columbia University Press, 2002.